Bakelite was an early plastic developed in 1907 by Belgian physicist Leo Baekeland and dominated the market for over forty years from 1910 to end of the Second World War. The versatile Bakelite was used initially in the electrics industry for radios and telephone casings and electrical insulators as it was electrically non-conductive and heat-resistant. 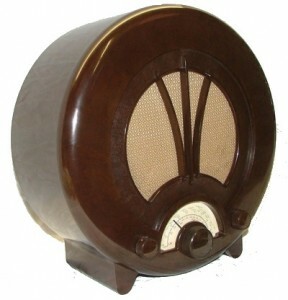 The Bakelite Corporation of the United States was founded 1910 to develop products and compounds but it was not until the 1920s that other more aesthetic uses were developed such as for the fancy fretted grilles protecting the loud speakers on early radio sets. 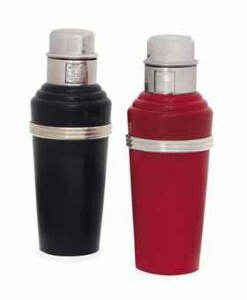 Pictured left: A Pair Of Art Deco Bakelite And Silver-Plated “Master Incolor” Series Cocktail Shakers sold for £2,750 at Christies, London, March 2012. In the 1930s and with the advent of new techniques to create bakelite in colours other than its orignal hues of brown and black, bakelite was used to replace the enamelling in the ornamentation of cigaratte cases, cocktai equipment and vanity cases. Moulded bakelite was widely employed in belt buckles, and the handles of umbrells, the backs of brushes and many other articles. 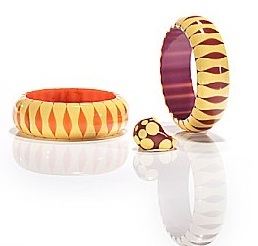 Pictured right: Two Bakelite “bowtie” bangle bracelets sold for $3,965 at Bonhams, New York, Dec 2009. In the 1950s new more versatile vinyl plastics were developed and the use of bakelite finally ceased. However, with interest in retro items continuing to grow, interest in bakelite items, bakelite jewellery and bakelite collectibles continues to grow. The range of bakelite item that collectors collect include radios, kitchenware, flatware, clocks, Bakelite handled utensils, telephones, and salt & pepper shakers. Prices and values continue to rise with special interest in bakelite radios, bakelite telephones and bakelite jewelry.